Born and raised in Malaysia, Alexander Ong apprenticed at the Shangri-La Hotel in Kuala Lumpur for 4 years before coming to United States. Recruited by the Ritz Carlton Buckhead in Atlanta, he has traveled throughout United States working on assignments for the company. In 1995, he moved to San Francisco where he worked with chef Jeremiah Tower at Stars for 3 years. 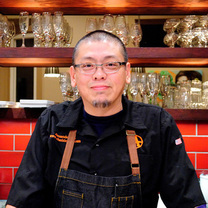 Though he was trained in classical French cooking, he decided to return to his Asian roots and opened Le Colonial’s kitchen and then Xanadu in Berkeley. Revisit some classics from the archives. Chef Alexander Ong talks about his favorite hamburger—a Baja-inspired hamburguesa from Don Pisto's in San Francisco—then gets in the kitchen with Chef Pete Mrabe to learn its secrets. No surprise, it involves a lot of bacon, mayo, and guacamole. In The Usual, the country's best chefs reveal the one dish that blows their mind again and again, then head behind-the-scenes to meet the creators. "Frog legs and grapefruit rice wine @dan_sung_sa_la 🔥"
"Pork bun with pickles @milkbarstore"
"B'day truffles and cereal milk while I decide on wedding cakes @milkbarstore"
"Namprik relish at Kin Khao. Umami bomb??? Yes & then some!!! Simple, clean & just pure satisfaction. Crispy, spicy, salty, sour, sweet, bitter & you can't stop eating it." "Meet KF Seetoh, author of Makansutra Food Guide & owner of Makansutra Gluttons Bay Food Court in Singapore. In his hands, the salted fish fried chicken wings. Light, crispy, salty & not oily. That with beer = Heaven."